Swiftlets are insectivorous birds classified within four genera viz. Aerodramus, Hydrochous, Schoutedenapus and Collocalia. They form the Collocaliini tribe within the swift family Apodiadate. There are around thirty species of swiftlets mostly confined to southern Asia, south Pacific islands and Northeastern Australia, both within the tropical and subtropical regions. 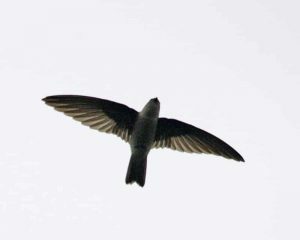 Generally, swiftlets have narrow wings for fast flight, in addition to a wide gape and small reduced beak surrounded by bristles for catching insects in flight. Nature has bestowed swiftlets with the ability to use a simple and effective echolocation to traverse in complete darkness through the crevasses and channels of caves where they stay at night and breed. Swiftlets are very aerial species of birds and spend much part of their life spans on their wings. They often fly at high speeds which is assisted by the morphology of their sickle-shaped wings. They have very small feet as is suggested by their family name Apodidae (meaning “feetless”) and are therefore, unable to perch. However, their tail feathers are modified which helps them to land on move on vertical surfaces. The plumage of swiftlets is either dull black or brown, whereas white or grey patches are found in some species, in addition to brighter chest-reddish throats in some others. Scientifically, Edible Bird’s Nest (EBN) refers to the nest of four species of swiftlets, namely Collocalia fuciphaga, Collocalia maxima, Collocalia germanis and Collocalia unicolor. Collocalioa Fuchiphaga and Collocalia germanis produce nests of pure saliva and thus called white nest swiftlets while the other two species produce nests with an admixture of feathers and vegetation, and are thus called black nest swiftlets. There has always been controversy regarding the taxonomy and phylogeny of swiftlets. Morphological and nest character in addition to the nature of prey, and echolocating ability have been used for the classification of swiftlets. All the swiftlets were placed into a single genus “Collocalia” by in 1840. Gray’s classification was used until the discovery of echolocation in swiftlets. Later on, Brooke split the genus Collocalia s.1 into three different genera, viz. non-echolocating Collocalia s.s., non-echolocating Hydrochous (comprised of the only giant swiftlet, Hydrochous gigas), and echolocating Aerodramus. However, in subsequent research works, different classification methods were used by different workers. All the above three genera were categorized into Collocalia s.1. By Chantler and Driessens and Salomonsen, whereas Chantler et al. And Sibley and Monroe divided swiftlets into two or three different genera. Most of the authors in the research papers on the investigations of the properties of EBN, did not disclose which swiftlet species were involved in nest building. The reason for non-disclosure of the identity of swiftlets is the inadequacy of the system of classification as none of the methods is distinctive without enough information to be reliable. In order to remove the chaos about the taxonomy and phylogeny of swiftlets, several molecular biological studies have been carried out. Lee et al sequenced cytochrome-b DNA of swiftlets, however, it was only 506 bp portion and thus several questions remained unanswered. Later on, Thomassen et all sequenced the cytochrome-b gene completely. But, the position of Hydrochous was uncertain due to the high amount of variation in cytochrome-b. Two years later, Thomassen et all further added two sequences to their original dataset of cytochrome-b sequences for finding the solution to the problem. The two sequences included mitochondrial 12S rRNA (12S) and nuclear non-coding Fib 7. The two sequences were believed to evolve more conservatively than cytochrome-b. Besides, the authors also sequenced cytochrome-b and NADH dehydrogenase subunit-2 (ND2) mtDNA of two speciments of H. Gigas and found that H. Gigas is the sister-group of Aerodramnus, which supported monophyly of swiftlets. In the recent past, Lin et all extracted and sequenced DNA from EBN based on sequence of cytochrome-b gene in mtDNA. The authors successfully identified the genetic source of Edible Bird’s Nest (EBN) and its products. It was observed that Aerodramus fuciphagus was the genetic source of Indonesian EBN. Despite the fact that advanced taxonomic methods have been developed, researchers often use the classification described in different times. More often EBNs are classified according to the place of origin. Until now, there are no standardized nomenclatures used for naming swiftlets as no consensus has been reached among the researchers on the issue. Swiftlets are insectivorous birds that have a worldwide distribution except for the Arctic and Antartic regions. Swiftlets (Collocaliini tribe) are small swifts that are distributed over areas ranging from the Seychelles islands of the western Indian Ocean through southern continental Asia, Indonesia, Palawan in the Phillipines, northern Australia, New Guinea, and the islands in the south-west of Pacific. However, EBN producing swiftlets are only found in Southeast Asia, in the aves in Adamman and Nicobar Island, Phuket, Thailand, Malaysia, Indonesia, Singapore and Indochina. The main commercial EBN producers include Indonesia (Sumatera, Java, Kalimantan and the Lesser Sunda Islands), Malaysia (including Sabah and Sarawak), Thailand, Vietnam and Myanmar. Some EBN producing EBN colonies have also been found in Hainan Island in China and Andaman and Nicobar Island in the Indian Ocean. However, the produce of EBN in these regions is relatively very insignificant. In eastern Malaysia, raw EBN is sourced from the caves of Madai and Gomantong in Sabah, the Niah Caves in Miri, the Jade Mountains of Baram and Dragon Mountains in Tatau and Bintulu. The population of the cave swiftlets in Sarawak and Sabah is estimated to be approximately 2 million birds. In western Malaysia, the main areas of EBN cultivation are Sitiawan, Teluk Intan, Kota Bahru, Kuala Terengganu, Parit Buntar, Bukit Mertajam, Nibong Tebal, Kuantan, Muar, Taiping and many other old townships. However, there is still lack of scientific approaches to precisely estimate the number of birds in Malaysia especially in Sabah and Sarawak. sir, may i know the technique on how to clean the bird’s nest into white without using hydrogen peroxide. I am from Davao city, Philippines.